Use to identify mold, bacteria, urine, counterfeit money, patches on the walls of a rental home and lots more. Use to find the source of an odor or other contaminant so that deodorizer treatments can be limited to the areas that really need it. When the UV light is held over an area with urine such as a toilet or a rodent trail the urine spots glow a bright purple. Mold and bacteria glow several different colors depending on the strain. UVL-21 (4 watt) fits comfortably in the hand. This lamp is available in 115V or 230V versions. 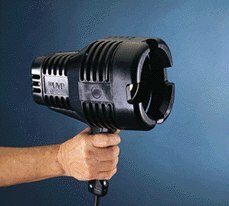 UVL-56 (6 watts) come with an ergonomically-designed handle. Lamps are lightweight.